While there was general cause for merriment in the festive season as 2017 drew to a close, LBS Bina Group Bhd had added reason to celebrate. This is because its group managing director, Tan Sri Lim Hock San, was awarded the prestigious Queen Victoria Commemorative Medal. Conferred by Europe Business Assembly, Lim received the medal at a special ceremony held at Oxford in the United Kingdom in recognition for embodying corporate social responsibility principles in his business strategy and operations. “I am humbled to receive this special award. Renowned author and speaker, John Maxwell, once said, ‘A leader is one who knows the way, goes the way, and shows the way’. I believe this is the only means to inspire the people we work with to achieve our goals,” Lim said at the ceremony. “Being a key business leader in Malaysia, we have a voice and LBS is passionate about using it to help communities around us. This award is also a nod to our dedicated employees who contribute toward pushing LBS to greater heights in the business sphere and in our community outreach efforts,” he added. Lim also said his company looks forward to expanding its reach in the near future because he believes that a thriving business and community outreach go hand-in-hand. Lim (centre) says that as a business leader in Malaysia, LBS is passionate about using its voice to help communities. The ceremony at Oxford coincided with a summit themed “Partnership, Innovations and Mastery”. Lim’s wide experience and influence on the business sector goes beyond his role as group MD for LBS Bina. His implementation of best business practices also includes leading the Federation of Lim Associations in Malaysia, being the founder and president of the Malaysia-Guangdong Chamber of Investment Promotion, as well as his involvement in the “Lianghui” – a collective event comprising the annual meetings of the National People’s Congress (NPC).He is also an active participant in the Chinese People’s Political Consultative Conference (CPPCC). However, his rise to prominence as a business leader stems from the growth of LBS into a public listed property development company with 30,000 homes built to date. The company has a current market capital worth RM1.6 billion and 4,000-acre land bank. LBS Bina has also expanded its portfolio into tourism through the management of the Zhuhai International Circuit in China. The Europe Business Assembly has a stringent five-step process before selecting recipients of the Queen Victoria Commemorative Medal. This begins with a qualifying stage which involves market research carried out by experts, research specialists and journalists. This is followed by a public evaluation and public scrutiny, before concluding with a final decision making stage and eventual award presentation. Medal recipient are those who have demonstrated exceptional participation in regional and international community programmes and projects, as well as actively support charity actions and achieved exemplary success in voluntarily improving the quality of life of the community and society at large. 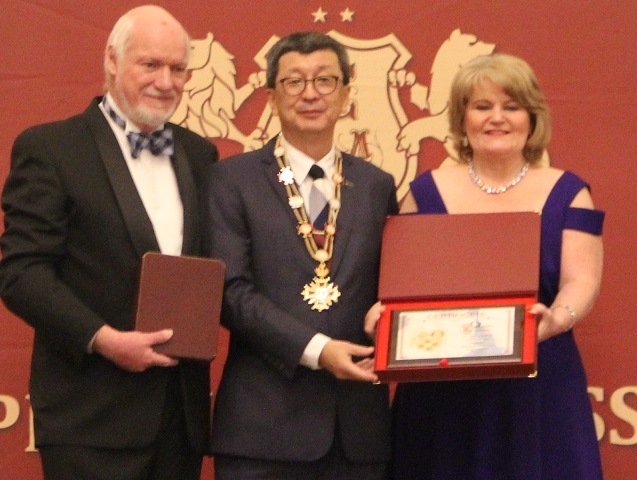 Lim was one of the three recipients, from a pool of nominees from 48 countries, to be honoured in 2017.